Mamuska! 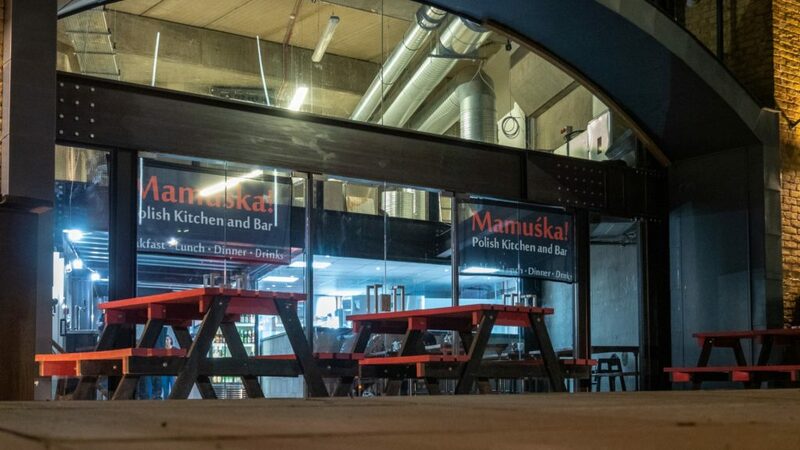 Leake Street Arches – Mamuśka! Duis et leo lacinia elit volutpat hendrerit. Orci varius natoque penatibus et magnis dis parturient montes, nascetur ridiculus mus. Quisque feugiat lectus feugiat lacus semper, nec varius velit vestibulum. Nam pellentesque varius lectus at semper. Aliquam luctus turpis massa, at laoreet lacus tincidunt in. Aliquam erat volutpat. Vestibulum vehicula nisi condimentum ante dignissim suscipit. Curabitur dignissim commodo tellus sed cursus. Suspendisse id consequat urna, venenatis dapibus turpis. Mamuska! is now open at the Leake Street Arches. Get down to @LeakeStreetArches and wing around to the Addington Street side, where you will find our big, beautiful, new pad. Our new site at Leake Street Arches is located at 9 Addington Street London SE1 7RY. We are just under the massive TV billboard advertising screen, at the intersection of Addington St, Station Approach Rd and Westminster Bridge Rd. We are open from 4pm weekdays and 1pm saturday and sunday. Get ready for big steels, a lot more tables, even better tasting food but with the same low prices. Thank you all for your patience and loyalty. We cannot WAIT to show you our new site, where we think you will feel right at home, as always, with Mama.